How can I remove the default shading of a simple model in 3DS max? I've been downloading free 3d models for a project that I'm working on, but I can't figure out how to disable the default shading. I'm using 3DS MAX 2013. I used the material editor to add a Diffuse material to the top of the table. 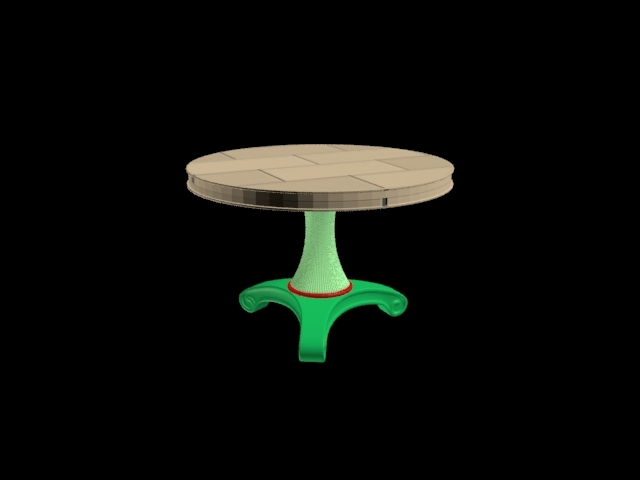 As you can see, there is shading around the front rim of the table, which moves with the table as I rotate it. Is it possible to disable this shading? If so, how can I do it? I read about Self-Illumination but I didn't have any luck in applying it to the model. Not the answer you're looking for? Browse other questions tagged 3d 3ds-max or ask your own question. How can I create a realistic 3d model from my 2d photos of furniture? What are the options for animating a camera sequence with 3D Max files? How do I reset the model matrix in 3Ds Max? 3DS Max: Multiple subtraction (boolean) - how to do it? How do I remove light from materials in 3DS Max? How to model with “isoline display” in 3DS Max?